and nylons like I did when I worked in a bank). fine now and well on the way to recovery. comforting food, and tender loving attention from the C’s can’t fix. And for that I am truly thankful. yourself some nourishment during trying times. steak or pork chops, which are similarly dreary when not freshly cooked. size pieces (make sure to include all the fat). onion is soft and garlic a bit toasty. be nice with some just-blanched peas mixed in as well. your table in no time! top of this will do miracles. to #fightfoodwaste under the tag #500daysoffriedrice 🙂 Here’s another idea for fried rice. Joey! I think the universe is doling out little frights here and there – I was involved in a 4-car pile-up earlier this week, and am slightly whiplashed, but otherwise fine. Good to hear that you are none the worse for wear!! Have been administering large doses of chicken egg drop soup… and lots of glasses of vino! Lamb fried rice with a frilly, runny-yolked fried egg on top is genius. If I ever get to do this I'll chuck in smoked pimenton and ground cumin. Some leftover grilled pork ribs got the same treatment in my kitchen a couple of weeks ago. Hugs and mend up 100% quickly! Hi Ling! Oh my!! Glad to hear you are fine! Take care and rest and recover well! Chicken egg drop soup and lots of vino…definitely a winning therapy! 🙂 I can imagine how delicious that fried rice with the leftover grilled pork ribs was! Hi Chef Nedra! Thanks for stopping by! And thanks for your comment 🙂 Wow…now I'm just one degree separated from Gordon Ramsay!!! Lamb fried rice is the best! My mom would make it for the family on special occasions, and it's so delicious! Glad you're home and feeling better. The lamb fried rice would certainly make me feel better at home. 🙂 Sending you good thoughts for a speedy recovery! lamb and rice! yum! what kind of oil do you use? im getting conscious about cholesterol but at the same time, want to use natural products as much as possible. get well! the bugs been going around! 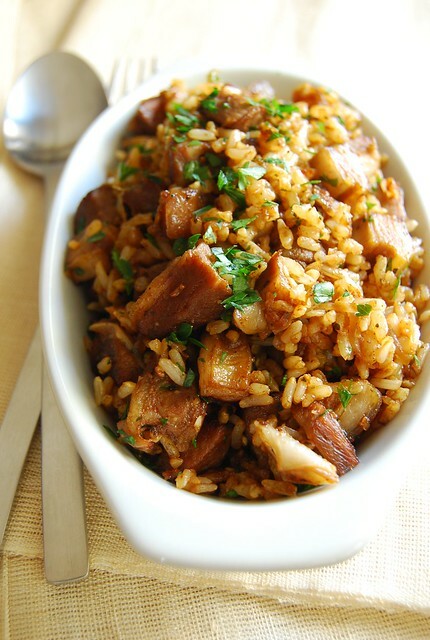 Lamb fried rice is something not too common to be prepared intentionally. I love it very much. And sorry to hear you ended up in hospital. Must be dreadful. Hi BettyAnn! It is a great way to make use of leftover lamb chops…and make them like new again! Hi Paz! Thanks so much! Thanks Shalum! I use olive oil because I like the way it tastes 🙂 I wish I could say I was more health conscious but unfortunately am not that virtuous! Hi Sycookies! Just using my leftovers 🙂 Yes, the hospital is most definitely not my favorite place! Life is all about falling and standing up and in process learning some valuable lessons. Glad you got a new perspective towards life. And yeah, I absolutely love Lamb fried rice. Such palatable food has always been my guilt pleasure. Cheers for this wonderful share!! I love lamb and rice. This looks fabulous. My mouth is watering already. I am trying this tonight. Thanks.